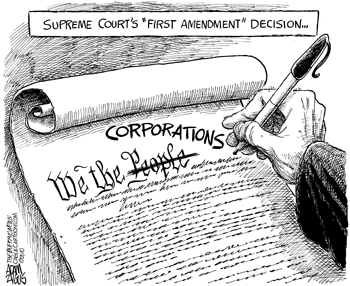 In its January 20th, 2010 decision in Citizens United vs. Federal Election Commission, the United States Supreme Court ruled that certain restrictions on independent expenditures by corporations for political advocacy violate the First Amendment of the Constitution, which provides that “Congress shall make no law […] abridging the freedom of speech, or of the press; or the right of the people peaceably to assemble, and to petition the Government for a redress of grievances.” Justice Kennedy, writing for the 5-4 majority, held that “[b]y suppressing the speech of manifold corporations, both for-profit and non-profit, the Government prevents their voices and view-points from reaching the public and advising voters on which person or entities are hostile to their interests” (Citizens United vs. Federal Election Commission 558 U.S. 38-9 (2010); emphasis added). Much of the language of the opinion, and some of its reasoning, as this passage illustrates, presupposes that corporations are agents capable of speech, and that it is (at least in part) in the light of this that limitations on political advocacy by corporations are prohibited by the Constitution. While there are other strands in the argument (see note 5 in particular), they are interwoven with the conception of the corporation as agent and speaker, with its voice and its viewpoints. The dissenters on the court objected on precisely this point (among others). Justice Stevens wrote sarcastically in his dissent, joined by Justices Ginsburg, Breyer, and Sotomayor, that “[u]nder the majority’s view, I suppose it may be a First Amendment problem that corporations are not permitted to vote, given that voting is, among other things, a form of speech” (558 U.S. 33 (2010)). Justice Sotomayor suggested in oral argument that the Court’s century-old practice of treating corporations as persons rests on a conceptual mistake. My concern in this essay is not with the question whether the restrictions violate the Constitution. There are many issues that bear on this which will be outside the scope of my discussion. My concern is with the proper conceptual framework for understanding the agency of corporations and corporate speech, and the role that conceptions of these play in the background of the majority’s reasoning. The issue is legal, but it also has philosophical, conceptual and semantic aspects. It will be the latter aspects, and their potential to shed light on legal reasoning, that are my main focus. An adequate framework requires saying what properly speaking the corporation is, how agency is expressed through the corporation, whose agency it is, centrally whether the corporation is an agent or person in its own right, and in what sense it can be said to be capable of speech. I draw on recent work in collective action theory, particularly with respect to the semantics of collective action sentences (Ludwig 2007) and the analysis of the proxy agency in collective action (Ludwig 2014), to show (i) that corporations are neither genuine agents nor (therefore) capable of engaging in genuine speech, (ii) that consequently the First Amendment does not apply to corporations per se, and (iii) that a better understanding of the mechanisms of corporate agency casts doubt on more indirect arguments for extending the First Amendment to “corporate speech” as well.